If you follow me on social media or have read my blog in the last few days, you may have noticed that I've just had my birthday! Woohoo! I've turned 20. Not so great. I would like to continue being a teenager thank you very much. If only. 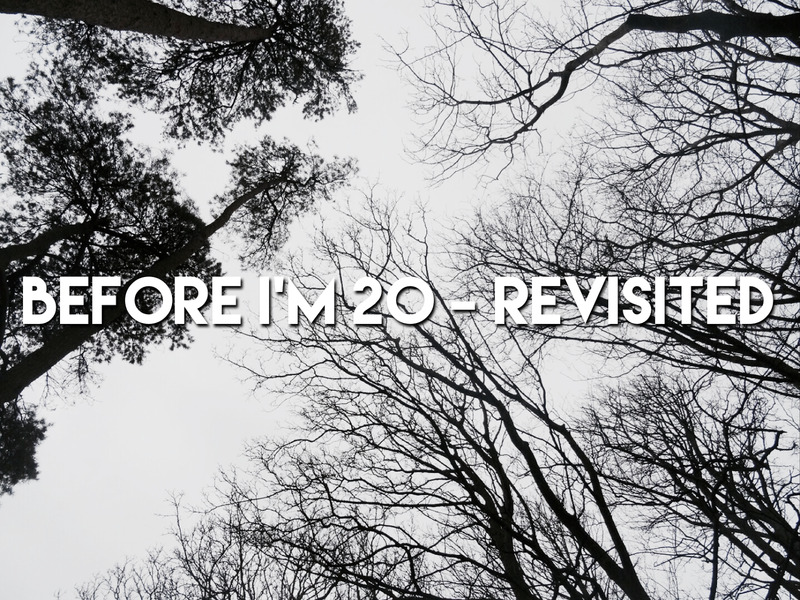 Anyway, last year I made a list of things I would like to achieve by the time I turned 20, so I thought today I review my list and see what I got up to! Document my 19th year of life as much as possible. Last year of being a teenager and all that! Clear out my wardrobe - we're talking deep clean. Read some books. Seriously just start reading again. Quite a lot of things there aren't there? Reading through them, a few stand out immediately. Firstly, learning to drive. Definitely one of my biggest achievements last year. I first got behind the wheel the last weekend in February 2015. I was terrified of just messing up, crashing my instructors car, or just being a generally rubbish driver. I had a lesson a week roughly until September, then booked my first test, failed, but then passed with flying colours at the beginning of November. Remember guys, if you're taking your test, don't forget to indicate on the very last roundabout! I was so happy and have been driving ever since. I actually commute to work everyday, and still live at home, so there's no reason for me to own my own car yet, so I'm a named driver on my Mum's car. I love it, I was pretty nervous for the first month I would say, it was so daunting being let loose on the roads, by myself! But I've relaxed into it now and love it! Last February was also when I managed to get a full-time job! I started my apprenticeship at a web design agency, and have just finished it! It's been such a great experience, I'm going to write up a proper post soon, but to keep you going if you're interested, read my post about why I chose an apprenticeship instead of attending university. These two things have definitely been my two biggest achievements of last year, and I think I can pat my 19-year-old self on the back and say 'Well done!'. I have managed to start reading more. Anyone else have the app Goodreads? It's weird, in the last year I'd say I've read about 6 books. Not as many as I would like by far, by an improvement on the year before. I go through a month of being a bookworm, and then a month of not being interested. I was thinking about why this is, and, I reckon that once I complete a book I've really enjoyed, I want to savour it for a bit, I don't want to read anything else because I'm still thinking about the last one. Hence the longs gaps between each book. Definitely going to try reading more this year, though. I never did complete the couch to 5k challenge. This was a real downer, but it seems either my running form is terrible (likely) or I'm just not cut out for it. I tried about three times last year, and every time, about three weeks in I would get awful shin splits. The pain! So, I joined myself up to the local gym and went a lot in the summer, managed to avoid it during the autumn, but have been going a minimum of twice a week since the start of January. That and my Fitbit (have you read why I love it?) has helped me get fitter and exercise without the pain of shin splints. As for second lobe piercings? Meh. I like how they look, but I've been having so much bother with my helix piercing, I've kind of been put off. That and I just don't seem to wear earrings that much. I'd definitely still like it done at some point, but I'm in no rush. Let's round it up now shall we? As for giving my wardrobes a deep clean, I think I have, or at least I did, but then I bought more clothes. This will be an ongoing battle. Holidays, on the other hand, last year the boyf and I didn't actually go anywhere! Never mind, we weren't really organised about it enough, however, we did go on lots of day trips last year, which I really enjoy. This year, however, we're off to France for a week and have a few long weekends in the works. Watch this space! I did, however, pop to Mallorca for a week with my best friend Niamh. It was lovely! We went in early September, had great weather, stayed in a lovely resort, chilled (boy oh boy was that good) and got more selfies than we know what to do with! This year, I'm going to start making a really big effort to save money, so that Jim and I (the boyf) can start thinking about really grown up things, like moving out! That is, once we've paid for the holiday! Apart from that, I'm not going to set such specific goals, because I really don't what this year will be like. I'm going to go with the flow and make sure I have as much fun as possible! If you've made it this far, thank you for reading. Have a cookie and grab a cuppa as a reward.